The argument between which is better, condenser or dynamic microphones has been raging on for ages. Though the differences are immense, it’s important to figure out exactly what you need for the project at hand. 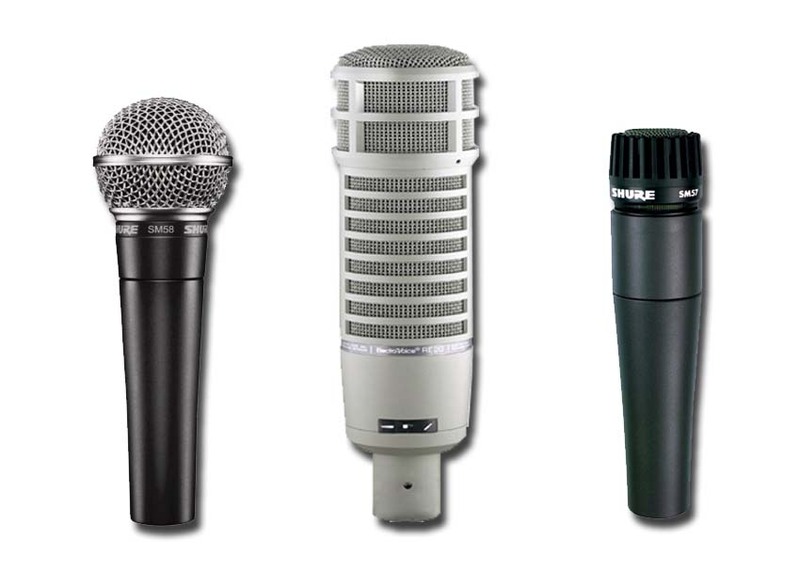 So with the vast dynamic and condenser microphone options available today, what should you use? Dynamic microphones. Left to right: Shure SM-58, Electro-Voice RE20, and Shure SM-57. Dynamic microphones are tour tested, road-worthy, and typically pretty inexpensive! 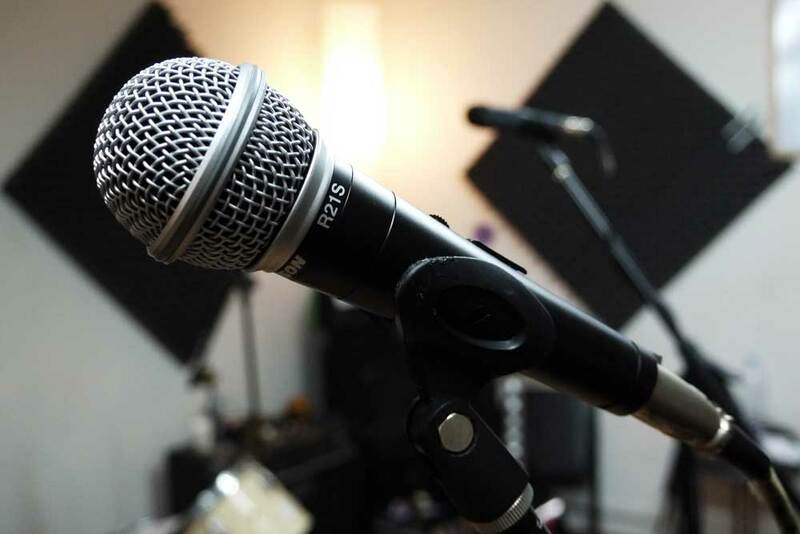 Mics like the Shure SM57 and Electo-Voice RE20 have been staples in the recording and broadcast industry for generations, due to their incredible durability. One way dynamics are different from condensers is in their parts makeup. 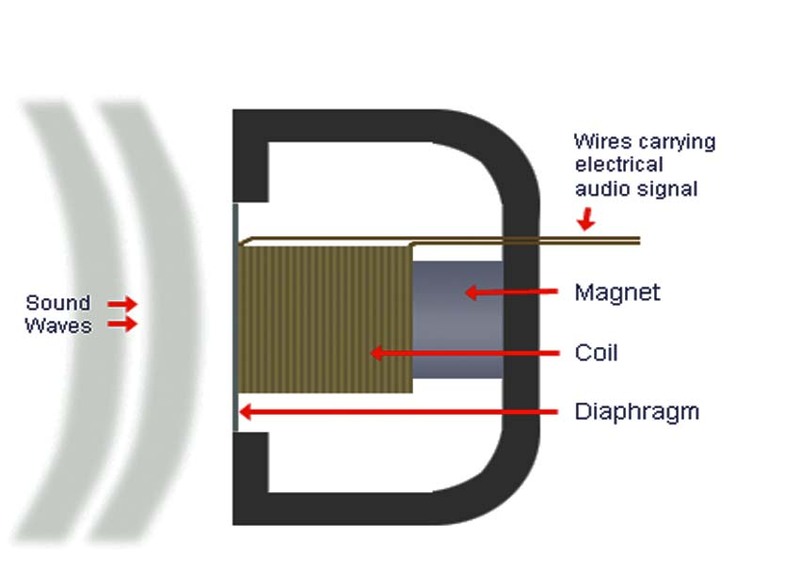 Dynamics use an internal moving coil that works by electromagnetic induction to cause vibrations in a diaphragm when sound waves enter. 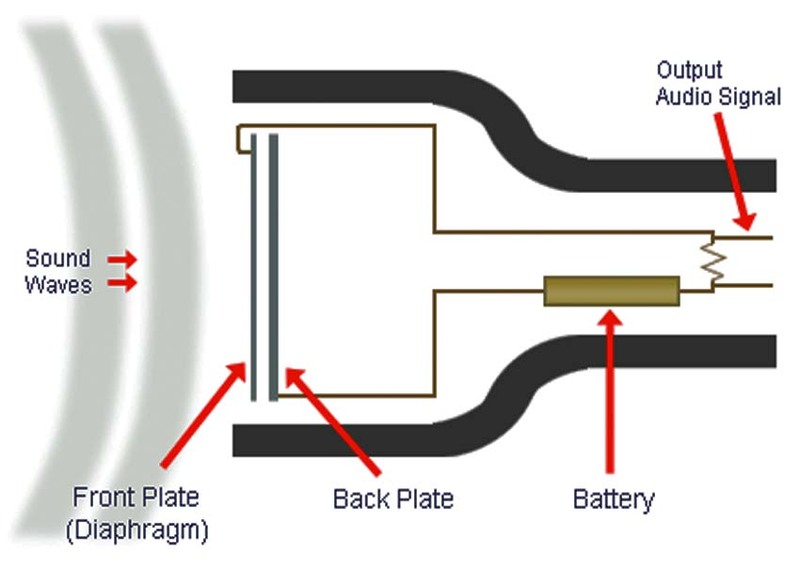 The internal design of a dynamic microphone. Image used with fair use permission from Media College. The process of magnetic induction is produced by an electromotive force, or voltage, that travels across an electrical conductor in a magnetic field. The waveform output of a dynamic microphone is directly affected by the actual velocity of the sound wave being received. Since the magnetic field that’s created yields a varying current, the mic itself doesn’t need external power to operate. Because of this “on-board power” and depending on sound wave velocity, the electrical signal is at a lower output level and will sometimes need to be amplified by a preamp or a device like the Cloudlifter mic activator. Condenser microphones. 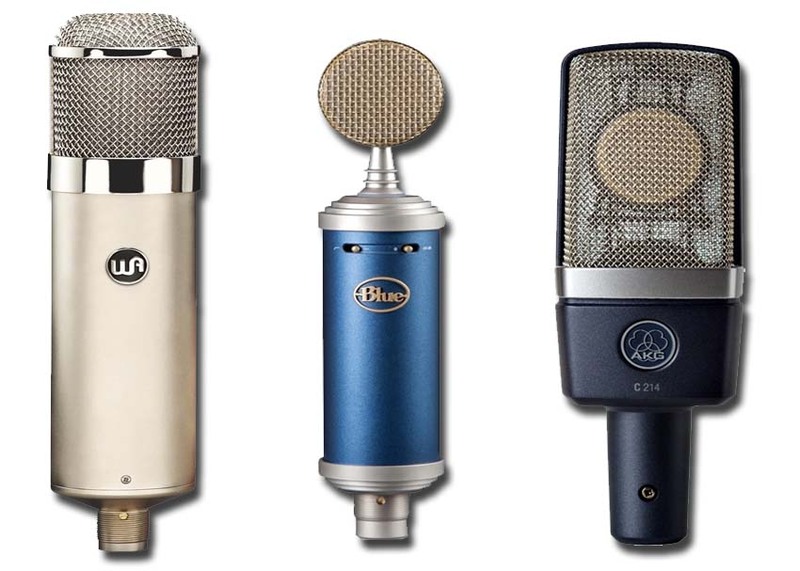 Left to right: Warm Audio WA47, Blue Bluebird, and AKG C214. Large diaphragm condenser microphones are the poster child for the recording studio business. You probably recognize them by their unique look, and shock mounts, and sonically they are set apart by their high sensitivity. In reality, though, condensers are just as approachable as dynamic microphones, albeit with a few quirks. The term “condenser” actually describes a capacitor inside the microphone. This capacitor uses a series of plates that vibrate and create a capacitance change that is then converted to an electronic signal that gets sent to a preamp. The only way the capacitor will work when a sound wave hits it is the addition of electrical charge. So, condenser microphones require phantom power at a constant +48 volts. This can be provided by an interface, a preamp or a battery. The internal design of a condenser microphone. Image used with fair use permission from Media College. Apart from the actual internal and operational differences between condenser and dynamic mics, there is a sound capture difference as well. 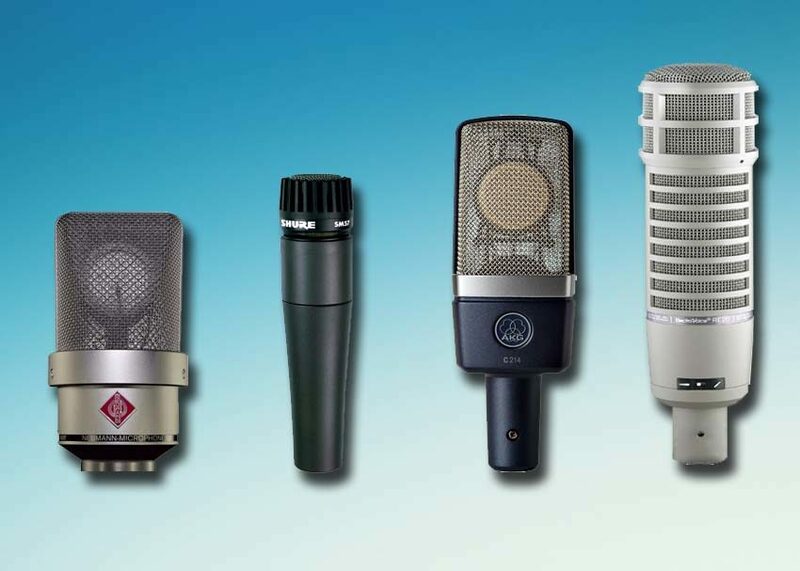 Condenser microphones boast a higher sensitivity to their dynamic counterparts. This means added response at high frequencies, which typically equates to a higher fidelity sound all together. This can also be a drawback for the condenser when it comes to recording at a higher sound pressure (higher decibel level.) It’s a common misconception that you cannot record high-volume sounds with a condenser; the capacitor can actually handle the high volume. It’s the job of the preamp to handle the load, and in most cases, the condenser is just too sensitive to capture loud audio (snare drum, loud vocal, etc.) without distortion. Hopefully the guide above has taught you that neither microphone type (dynamic or condenser) is better or worse than the other. These are all tools for specific jobs in sound design and audio capture, and each can yield amazing results. For example, If you have a singer-songwriter with a low voice, a condenser will most likely do the trick in capturing their vocal complexities better. But if you have a big, 4×12″ Marshall guitar cabinet pushing a ton of air to record, then the lower output and sensitivity of a dynamic mic will work wonders. So go out and find something that will work for your project. Experiment with both types of microphones on multiple instruments, vocals and percussion. The worst thing you’ll find is a new sound to add to your repertoire.